Aloha from Poipu Beach, Kauai, Hawaii! EarthCam and The Parrish Collection Kauai invite you to the beautiful island of Kauai in Hawaii. Experience breathtaking views of this popular island and enjoy its spectacular surf and stunning sunsets. After watching the breathtaking view of Kauai and its spectacular surf and sunsets, The Parrish Collection Kauai invites you to see many more from any one of their distinguished collections of Kauai vacation homes and Kauai condos. The Parrish Collection Kauai represents over 200 properties island wide including the most oceanfront Poipu rentals. You'll also find them at the finest Kauai resorts and on the beautiful North Shore. For over 27 years, The Parrish Collection Kauai has been welcoming visitors with their award winning service and a team of 30 professionals dedicated to making Kauai vacations memorable. 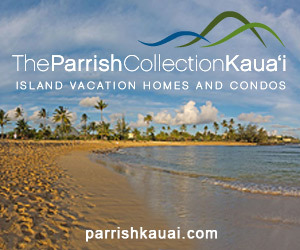 For more information, visit the website at http://parrishkauai.com.